Filming has begun on location in England and Scotland on the Working Title Films production of Mary, Queen of Scots, starring Saoirse Ronan in the title role opposite Margot Robbie as Elizabeth I. Josie Rourke, artistic director of The Donmar Warehouse, makes her feature directorial debut on the movie. Focus Features holds worldwide rights and will release Mary, Queen of Scots in the US and Universal Pictures International (UPI) will distribute the film internationally. The producers of Mary, Queen of Scots are Working Title co-chairs Tim Bevan and Eric Fellner, and Debra Hayward, all Academy Award nominees as producers of Best Picture Oscar nominee Les Misérables. Beau Willimon, an Academy Award nominee for The Ides of March and Emmy Award nominee for “House of Cards”, has written the screenplay adaptation. Mary, Queen of Scots is based on John Guy’s acclaimed biography My Heart is My Own: The Life of Mary Queen of Scots. Joining the cast are Jack Lowden (Dunkirk, England is Mine), Joe Alwyn (The Sense of an Ending, Billy Lynn’s Long Halftime Walk), Martin Compston (Sweet Sixteen, “Line of Duty”) and Brendan Coyle (“Downton Abbey”, Me Before You). Also featuring in the cast are David Tennant (“Doctor Who”, “Broadchurch”) and Guy Pearce (Memento, LA Confidential, The Adventures of Priscilla, Queen of the Desert). Saoirse Ronan earned her first Academy Award nomination for Focus and Working Title’s Atonement, and was again an Academy Award nominee for Brooklyn; she also starred for Focus as the title character in Hanna, and other past credits include The Grand Budapest Hotel, How I Love Now and The Lovely Bones, as well as the upcoming Ladybird, On Chesil Beach and Loving Vincent. She recently made her Broadway debut in The Crucible. Ronan resides in Ireland. Margot Robbie, a BAFTA Award nominee, has starred in such blockbuster hit movies as The Wolf of Wall Street, The Legend of Tarzan, and Suicide Squad, for which she won a Critics’ Choice Award. 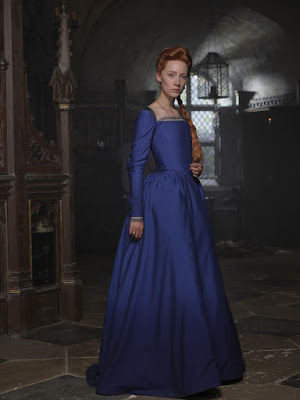 The filmmaking team for Mary, Queen of Scots includes Academy Award winners costume designer Alexandra Byrne, make-up and hair designer Jenny Shircore and editor Chris Dickens, Emmy award winner production designer James Merifield and BAFTA award winner director of photography John Mathieson. Tim Bevan and Eric Fellner have been co-chairs of Working Title Films, one of the world’s leading film production companies, since 1992. Working Title has made more than 100 films that have grossed over $6 billion worldwide, including over $1 billion at the U.K. box office. Its films have won 12 Academy Awards (for Tom Hooper’s Les Misérables and The Danish Girl; James Marsh’s The Theory of Everything; Tim Robbins’ Dead Man Walking; Joel and Ethan Coen’s Fargo; Shekhar Kapur’s Elizabeth and Elizabeth: The Golden Age; and Joe Wright’s Atonement and Anna Karenina), 39 British Academy of Film and Television Arts (BAFTA) Awards, and prizes at the Cannes and Berlin International Film Festivals. The company’s commercial and critical hits include The Interpreter, About a Boy, Notting Hill, Elizabeth, Fargo, Dead Man Walking, Bean, High Fidelity, Johnny English, Billy Elliot, Four Weddings and a Funeral, Bridget Jones’s Diary, Bridget Jones: The Edge of Reason, Bridget Jones’s Baby, O Brother, Where Art Thou?, Love Actually, Shaun of the Dead, Pride & Prejudice, Nanny McPhee, United 93, Mr. Bean’s Holiday, Hot Fuzz, Elizabeth: The Golden Age, Burn After Reading, Frost/Nixon, Atonement, Senna, Tinker Tailor Soldier Spy, Anna Karenina, Les Misérables, I Give It A Year, About Time, Rush, The Two Faces of January, Trash, The Theory of Everything, Legend, Everest, The Program, The Danish Girl, Grimsby, Hail, Caesar! and the recently released Baby Driver. Working Title’s slate includes The Snowman, directed by Tomas Alfredson and starring Michael Fassbender, Rebecca Ferguson, and Val Kilmer; James Marsh’s untitled Hatton Garden project, starring Michael Caine, Jim Broadbent, Tom Courtenay, and Ray Winstone; Victoria & Abdul, directed by Stephen Frears and starring Judi Dench as Queen Victoria; Darkest Hour, directed by Joe Wright and starring Gary Oldman as Winston Churchill; and the untitled Entebbe project, a gripping political thriller directed by José Padilha and starring Rosamund Pike and Daniel Brühl. Focus Features (www.focusfeatures.com) acquires and produces specialty films for the global market, and holds a library of iconic movies from fearless filmmakers. In addition to Victoria and Abdul, the untitled Entebbe project, Mary, Queen of Scots, and Darkest Hour, current and upcoming domestic releases from Focus include Sofia Coppola’s The Beguiled, winner of the Best Director award at the 2017 Cannes International Film Festival; the breakneck action-thriller Atomic Blonde, directed by David Leitch and starring Charlize Theron and James McAvoy; Jason Reitman’s new comedy Tully, starring Charlize Theron and written by Diablo Cody; and the untitled new film from Paul Thomas Anderson starring Daniel Day-Lewis. Focus Features, Universal Pictures International, and Working Title Films are part of NBCUniversal, one of the world’s leading media and entertainment companies in the development, production, and marketing of entertainment, news, and information to a global audience. NBCUniversal owns and operates a valuable portfolio of news and entertainment television networks, a premier motion picture company, significant television production operations, a leading television stations group, and world-renowned theme parks. NBCUniversal is a subsidiary of Comcast Corporation.